The spirit of fear torments, paralyzes, traps and even kills. You do not have to become a victim of fear, but you can learn how to conquer it. When you know the reasons why you do not need to fear, you will be empowered to defeat it. Seven reasons why you do not need to fear. You are never alone because God will never leave nor forsake you. 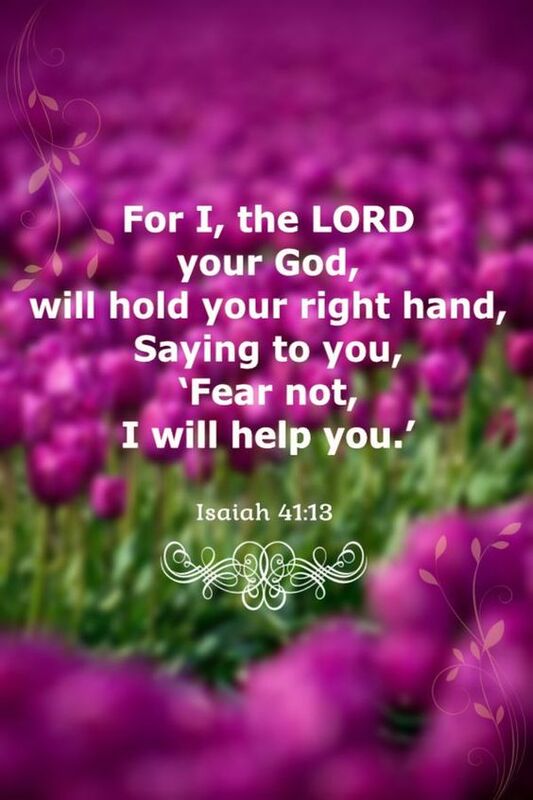 He holds your right hand and hears your prayers. The Lord is fighting your battle. The Lord has already delivered the enemies into your hands. Those who are with you (angels) are more than those who are with them. God has a hedge of protection around you. You have been redeemed by the blood of the Lamb. Hence, you are forever on the heart of God. The Lord has inscribed you in the palm of His hands. Because you trust in the Lord and your hope is in Him, you will be like a tree planted by the waters, which spreads out its roots by the river, and you will not fear when heat comes; but its leaf will be green, and will not be anxious in the year of drought, nor will you cease from yielding fruit (Jeremiah 17:7-8). Genesis 26; Deuteronomy 3:22;31:6-8; Joshua 10:1-8; 2 Kings 6:16; Job 1; Psalms 118; Isaiah 35:4; 41:10-13; 43:1-5; 44:8; 54:1-14. Share with us the reason why you are not afraid. Amen! So good. Thank you and bless you, Sister. Amen. Yes He does! Thank you and blessings to you. True. However you have not seen the size of the rats in my neighborhood. New York city has a serious rat infestation problem. Not just in the subways but on the Street in parks and on the sidewalks. The only time the rats leave is during winter snowstorms and blizzards. Sorry to hear about the rat infestation.I hope the city can get rid of them. Thamk you for visiting. I spoke with the Rep. For my neighborhood. The house has been cited by the department of health. I’m very good at Activism. I will be happy to get them off my block. Given that there’s more rats than People living in New York City small victories are important.